This page was updated 1-1-2019. True Believers in Evolutionism (TBEs) either misrepresent (i.e. lie) or totally misunderstand evolution. Anyone who believes in evolution is uninformed, dishonest, or gripped by a fervent religious agenda. Also, evolution is a form of propaganda. There is a COMMON THREAD (especially the Addendum) connecting evolutionism and the One World Religion. To atheists, evolutionism is crucial to their religion and their only hope of crushing the cause of Christ. “I think that evolution is absolutely the death knell of Christianity.” (Frank Zindler, in a debate with William Lane Craig, Atheism vs Christianity video, Zondervan, 1996). Atheists use a type of germ warfare. They will not retreat and public schools are the main means used to infect the minds of children with the spiritually and scientifically debilitating disease of Darwinism. Christians must RESCUE THEIR CHILDREN! See the list of teachers who got into trouble for teaching the truth at the bottom of Can a Christian Work in the Government School System?. The deadly germ is a LIE. My progress toward proving that evolutionism is a bald-faced lie began in 1998 when I challenged the Grandmasters of evolutionism in Kanawha County and West Virginia and concluded in 2004 when I declared "Checkmate"! The misnamed National Center for Science Education (NCSE), American Civil Liberties Union (ACLU), and other true believers in evolutionism are staring at the chess board and will certainly try to spill the pieces and declare the game void, but the truth is they have lost. Highlights of this "game" consisting of a multitude of moves and countermoves follow. The first salvo of the game was an attempt at "Fool's Mate" with an Opening Game now known as the "Evolution Resolution". The Board of Education voted the Resolution down, but the BOE based its decision largely upon a policy on the teaching of "Controversial Issues" which they said covered the criticism of evolution. In order to reject the Resolution, board members had to say some things that were totally illogical and biased. Every move takes at least a pawn from the evolutionists. A major capture of evolutionist's bishops was obtained from my Grievance. A central office administrator had told me that I could criticize evolution. However, after the uproar that developed during the debate over the "Evolution Resolution" there was a high degree of doubt about the administrator's intent. The administrative law judge (although ruling against me) brought clarity by formerly stating in the decision that I "Was given permission to criticize evolution"
The Middle Game strategy involved an attempt to insert the book Pandas and People into the hands of science teachers. This really exposed the bigotry and duplicity of the evolutionists! After I spoke at a BOE meeting a very professional looking and well-spoken parent went to the podium. He began to read from a book which had been assigned to his daughter (a high school junior). Before he read a paragraph the BOE president stopped him because of the sexually explicit material. This gave board member Betty Jarvis an opening and a long debate resulted over why students were required to read material that could not be read at that meeting (which is televised locally by tape delay). In the discussion, Betty pointed out the BOE was preventing teachers from being exposed to "Pandas" while allowing students to read material that is highly offensive. An attorney from the Thomas More Center for Law and Justice, offered the board free legal services if the BOE had adopted "Pandas". We lost that vote 3- 2 when a professed Christian BOE member surprisingly voted "no" even though the only BOE member who was a scientist voted "yes". However, Mrs. Jarvis got permission to privately finance the placement of the books into secondary school libraries. The evolutionists lost both knights in this part of the game. To begin the End Game moves a parent filed a grievance over scientific errors in newly adopted science books. In the ruling against her the State Board official stated "There is agreement that students should be taught in their science classes to examine data critically considering both favorable and opposing hypothesis. To do otherwise, is to shortchange both the students and the scientific process; and, it is the role of the teacher to present an instructional balance as it relates to various theories that are included in the textbooks." Then the game moves went into the strategy of the wording of new State Science Standards. Once again the evolutionists made some moves that exposed their tendency to cheat when they see a fair game would result in their resounding defeat. This time the final ruling included an oral discussion by the State BOE which emphatically made the following part of the official record: "Teachers can teach evidence against evolution." To place my opponents into "Check" I made an appearance before the BOE on September 21, 2000 to say, "I am here to respectfully inform you that I intend to do just that (criticize evolution) in my classroom. I will present, from secular sources, material that exposes evolutionism as absurd." "I will encourage my colleagues in math and science to do the same thing by teaching all the facts about evolution. I will encourage teachers from head-start to grade 12, in all content areas, to join us. I will encourage Current Events teachers to expose that Australian aborigines were considered flora and fauna until recent times because of Darwinism. I will encourage history teachers to reveal what was done to blacks and the handicapped due to eugenics which was rooted in Darwinism. I will encourage those who teach ethics to reveal the scary facts of Social Darwinism." "I will encourage art instructors to show how pure imagination is used to depict "missing links," particularly the complete family that was painted from viewing a single tooth which later was identified as belonging to an extinct pig? I will encourage evolution be taught in language classes. What a rich source for the fantasy genre of 'Just So Stories'. We may discover another Kipling." I sent a letter with similar content to the State Superintendent of Schools. In it I said that I will teach that the evidence clearly shows that every item associated with humans, animals and plants are Intelligent Designs and Intelligent Design is science because it is observable by billions of people trillions of times, always has been, always will be. The evolutionists lost their queen. I did the things I said I would do and formally, in writing, informed the NCSE and ACLU that I had done so. The "Mate" move was when I informed both the NCSE and ACLU (see “The Line in the Sand” below.) that I had included a component showing students that every item associated with humans, animals and plants are Intelligent Designs and Intelligent Design is science because it is observable by billions of people trillions of times and it always has been. The game is over. Precedent has been established. Teachers, in West Virginia, can attack evolution as much as they desire. The next phase for me is to train and encourage other players to enter the game and control the board with an offensive attack that can't be countered. If you would like for me to speak at your church or organization with details of the above history schedule my "Grassroots Report" presentation. For more details about my battles against the lie of evolutionism please see my testimony. For video of some of the battles “See for Yourself”. POSTSCRIPT: Sadly, to my knowledge no teacher took advantage of the right to teach their students the truth. That proves, beyond any doubt, that government schools are not redeemable. Christians must RESCUE THEIR CHILDREN! The courageous kids of the first (and only?) Creation Club would be at serious risk today. In December 2005 I sent the following information to the National Center for Science Education, American Civil Liberties Union, People for the American Way, Americans United, and American Atheists. I drew a line in the sand and they did not step across. I am sure the ACLU will support what I am doing (details below) in contributing to critical thinking in the public schools. Please post your support on your website and through a press release. I am a recently retired public middle school teacher in West Virginia with over 30 years experience as an educator including administration. For the last five years of my full-time career, with the full knowledge of all officials, I demonstrated to my students that evolutionism is nonsense. The students saw that the evidence clearly shows that every item associated with humans, animals and plants are creations and creationism is science because it is observable by billions of people trillions of times, always has been, always will be. I always let them figure this out by themselves and allowed them to believe what they chose, but the students were exposed to the scientific facts that extremists want to censor from the minds of public school students. After the lesson a student from an atheist family said, "Evolution is silly." For a year afterwards, as a substitute teacher, I had contact with more public school students than ever and took advantage of every opportunity to provide them with the facts described above. I have a Power point presentation about the history of the above mentioned battles which I present to interested groups. For information about scheduling the presentation please see "Get Bugged" in the left margin. *For more about the professed Christian BOE member see “Abstinence-only curriculum not supported in W.Va 4-12-13”. Following is a typical challenge sent to aggressive evolutionists worldwide. Read a History of the Debate Dodger list. Also see Evolutionists are full of Hot Air. I am just not very articulate. For example, I describe something that is idiotic as "idiotic"and I call a liar "a liar". There are others who are quite eloquent with humor and creativity . "Evolution is a lie, but an extraordinary lie. It paints a picture of the real world the exact opposite of what it is. It says the universe is evolving while science tells us that everything is devolving. It says time acts like an engineer while science proves that time exclusively ravages. It claims the Earth is old, yet science finds the Earth young. With frauds and forgeries, it claims ape-men as ancestors while science indicates Adam and Eve were brand-new humans. It is like a photographic negative in which snow is black and a blackened chimney is white. What is on the right in the real world, evolution shows on the left. The initiated are invited not only to hallucinate out of touch with reality, but to fantasize that reality is the opposite of normal experience. Evolution teaches a peerless, negative, grandiose, functional psychosis. That it may have one sincere adherent is a compliment to its propagandists and an immense disparagement to the entire human race." World renowned butterfly expert Bernard d'Abrera* describes evolutionism with clarity. Bold font is mine. See more quippable quotes at Joe’s Gems. *Bernard d'Abrera is an entomological taxonomist and phi­losopher of science who compiled Butterflies of the World which consists of volumes containing about 7,500 pages with descriptions and/or illustrations . Q: The dictionary says that a lie is a false statement made by a person who knows it is false, and attempts to pass it off as a true statement. So, isn't it too harsh to say evolution is a lie? A: If "lie" is too strong someone better tell Ken Ham (of Answers in Genesis) who wrote the book The Lie: Evolution. If you are claiming that evolutionists sincerely believe in evolution you are wrong. Pithecanthropus alalus was an artistic rendering of pure fiction, not one splinter of bone or tooth, given a scientific name with the express purpose to deceive. Likewise with every ape-man, the embryo forgeries, Protamoeba primitiva, the molecular clock, the peppered moths, the neck of the giraffe, homologies, biologically advantageous mutations like the sickle cell genetic disorder and 15,000 others, the old Earth, and so on, and so on ad infinitum. Therefore, evolutionists deliberately lie and lie is by definition, correct. However, "lie" is deficient because it understates almost to the borderline of fiction. More precisely, evolution is an inverted fantasy religion based on vitalism superstitions 2,500 years old, the exact opposite of and excluded by reality, taught exclusively by frauds and forgeries, brass and bluff, in the public schools in violation of the First Amendment of the Constitution of the United States of America and protected by malignant, vengeful censors. (Special thanks to Dr. Joseph Mastropaolo for most of the wording on this section). See and hear Dr. Mastropaolo and me on YouTube. IMPORTANT: The most important thing is for evolutionists to GET SAVED. Many will choose not to get saved and will try to spread their lie. The lie should be exposed. 2. Bumper stickers (design your own). These can be on vehicles and school notebooks/trappers. 4. Design your own T-shirts. Please send photos of the shirt you design. 5. 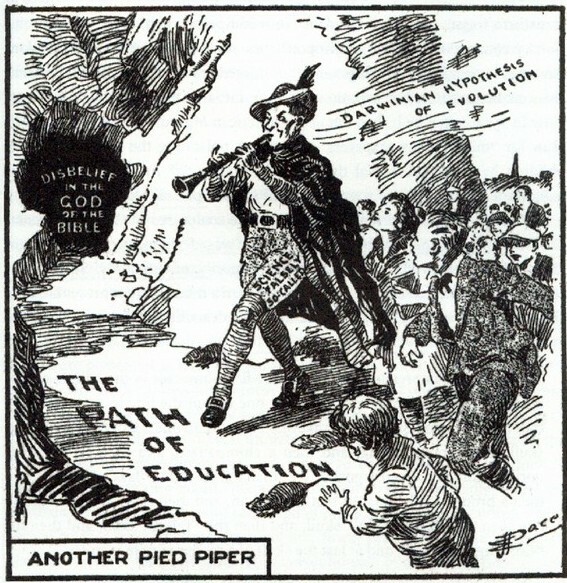 Politely ask teachers: Have you heard of the National EVOLUTION IS A LIE Campaign? What part (just name one) of evolution is true? Then depending on the individual situation the student can question further or hand the teacher the Life Science Challenge. ALERT : THIS IS FOR COLLEGE STUDENTS ONLY. PRE-K-12 STUDENTS SHOULD NOT BE IN GOVERNMENT SCHOOLS!“ Sending Suicide Squads into Schools” (scroll down to February 28). 6. Engage folks in conversation and try to leave a Life Science Challenge with them. 7. Use Chick Tract Tip ideas and distribute the Life Science Challenge leaflets. 8. Insert these ideas into your church bulletin. 9. Set up a booth in a public area. Here are some for pictures of me at the state capitol building. 10. Have fun and hit evolutionists with humor like Joe’s Gems. The EVOLUTION IS A LIE campaign was launched August 24, 2005 by the West Virginia Kanawha Creation Science Group in conjunction with a local Creation Conference. Two members spent an hour on each of two days at a busy intersection holding signs. The strategy of holding signs at busy intersections is used effectively by pizza shops, politicians, pro-life groups, and many other entities. How easy is it for you to avoid reading the sign held by a vagrant standing at an intersection? Following are tried and proven suggestions. Go as a pair for obvious reasons. A pair can also cover diagonal corners (depending upon traffic flow). Of course the more the better. Four can cover each corner and a larger group can string out in conspicuous spots. Have prayer before and after your activity. A meet or coffee together afterwards is also a good idea. The object is to get your sign read by as many people as possible. Choose a busy location where traffic is not moving at high speed. Pick a heavy traffic time of day. Plan where to stand that is reasonably safe. The entrance to a public school when buses arrive or leave would also be a good location. Be sure you hold the sign at an angle and level that allows motorists to easily read the sign. Also, be aware if the sun is behind you because it can prevent drivers from focusing on your sign. It's not always possible to avoid having your back to the sun, but you can try to angle the sign so drivers can read it without being blinded. If possible have a two-sided sign so traffic in the other direction will get an idea of why you are there. This is important if you can't cover four directions thoroughly. The wording of signs should be concise. Keep it "short and sweet". Think "bumper sticker". People in moving vehicles do not have time to read more than just a few words. For the first event a 2 by 3 ft. sign EVOLUTION IS A LIE using white 8 in. letters with a black background was placed at the top. Below this was a 1 by 3 ft. red on white CREATION CONFERENCE STRIP in 7 in. letters. At the bottom was a strip measuring 1 by 3 ft. with the name of the church and dates of the conference in blue on white 3 5/8 in. letters. If the bottom two strips are unneeded the Styrofoam can be cut to a smaller size. Of course larger signs can be purchased. The original group to do this purchased professionally prepared signs from a local sign shop. In 2005 a 2 by 3 ft. sign was priced at about $23. The signs can be mounted on 1/2" Styrofoam insulation with clear packing tape or large binder clips. You may want to weather proof the sign with clear plastic. A 4 by 8 ft. sheet of Styrofoam can be cut into five 2 by 3 ft. signs. Small rope can be used to hold 2 by 3 ft. signs around an individual's neck. If you are comfortable with doing it and traffic is frequently at a standstill you can offer flyers to vehicles. The best way is to hold the paper out and use body language to inform the individual you are offering the flyer to them. Let them indicate they wish to take the flyer. Even if literature is not distributed it is recommended that a supply of the following flyers be kept on hand in case someone wants to argue. Just politely convey that you will not argue and offer them a leaflet with the following message which can be copied two to a page and cut into half sheets of paper. See the "LIFE SCIENCE PRIZE CHALLENGE." The following are miscellaneous ideas. They are included in an effort to provide as much information as possible on the subject. You will have fun, inspire others, and get the tension released of wanting to do something or fight back against evolutionists. You will meet folks you would not have met that will be an inspiration and will remain your friends. 1. Some of you may be very outgoing and do a lot of waving while others may be more serious. Everyone should acknowledge a honk or wave by returning a nod or wave. Include a smile. 2. Keep the high road if you hear catcalls or see obscene gestures. 3. Have a plan in case of physical attack. We have a video camera and still camera at the ready. If someone approaches one of us, at least one other of us moves in close. We also have cell phones. These plans have come in handy in more hostile situations such as antiabortion vigils. 4. Those who are knowledgeable and articulate can be designated as spokesmen to the media. In reality anyone approached can speak their piece if they are comfortable with it. 6. It is OK to stand and talk briefly, but you should try to space out about 20' for a stronger effect. 7. Be sure that you do not block sidewalk passage and you should have no trouble from the police. It never hurts to inform local law enforcement that you will be coming. 8. Special effects such as monkey puppets or ape heads are effective attention getters. It is not advisable to wear an ape mask due to legal and safety factors. 9. If you want to liven things up and you have enough participants include a couple of signs that say, "HONK FOR CREATION." ATTENTION: The below was written before I realized the absolute danger of students trying to influence government schools. Please see Sending Suicide Squads into Schools. Eliminating the “parental permission,” some brave college students may get a useful idea. It is very important that you ask your parents to see my EXODUS MANDATE page. Click the button on the left. If you remain in a government school, here are some ideas (with parental permission) that you can do. You should always be respectful and get parental permission before using any of the following ideas. If you try any or these, or some of your own, please email a report to us. 1. Ask your teacher questions when he/she starts to teach evolutionism. Start with "Do you really believe that?". You deserve a quality education so your teacher should also answer "What proof do you have that it is true?". If you have the opportunity, ask dozens of questions that will reveal that evolution is a lie. Finally ask, "May I bring in facts that show another viewpoint?". 2. Wear T-shirts and bumper stickers that say in bold letters: EVOLUTION IS A LIE. 3. Start a fad that mocks the lie of evolutionism. For example, one thing that could be done is singing the following song to the tune of Pink Floyd's "Another Brick In The Wall". We don't need no evolution. No dumb fantasies in the classroom. Teacher, leave us kids alone. Hey, teacher, leave us kids alone! All in all it's just another lie in the wall. All in all you're just another lie in the wall. Teachers, leave us kids alone. See "If it wasn't so Funny I'd Cry" and "Bugging TBEs (Evolutionism is Full of Bugs)". See the Evolutionism (18) section of “Liberalism is Evil”. Hear evolutionists confronted with the Life Science Prize. LISTEN TO SOUNDS OF EVOLUTIONISTS PROVIDING PROOF OF EVOLUTION. Read testimonies of men Transformed by the Evidence. The Darwin model for theory production: (1) Believe in evolution with all your heart. (2) Observe a fact. (3) Make up a story to fit the fact into your Darwinian belief. IMPORTANT: a person can believe that evolution is not true and still end up in hell. The most important thing on this entire website is how to GET SAVED.